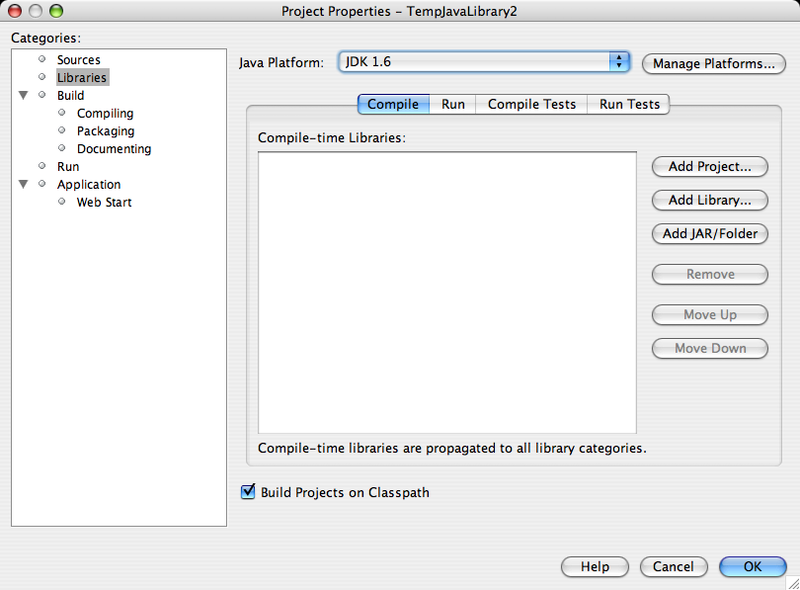 This article describes how to add a Java Platform to NetBeans under Mac OS X. This enables you to compile and run your applications under different virtual machines and also to associate Javadocs and source code with a Java platform so that they can be used by NetBeans for code generation and in-context tips and documentation. Click the Add Platform… button. 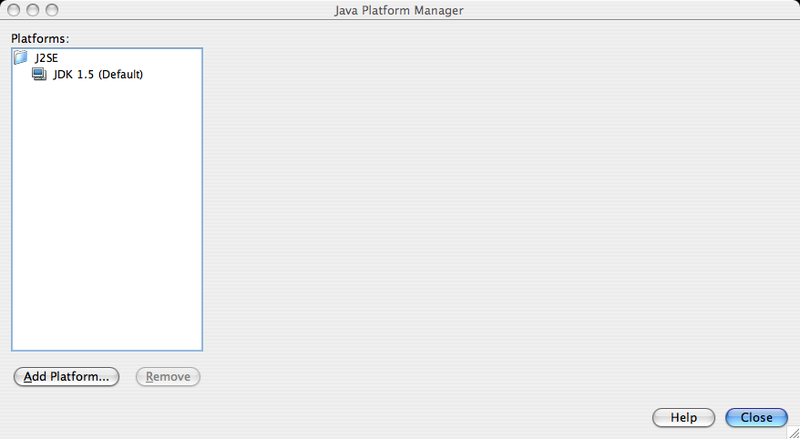 This will open the Add Java Platform window. 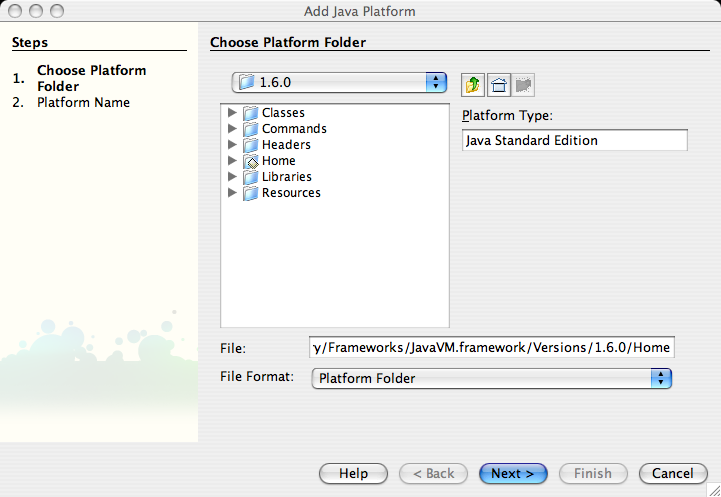 Here you will seen all of the Java Platforms that are installed your system. Drill down until you find the Home folder. Select it and click the Next button. If you have locally stored copies of source or Javadocs you can associate those with the platform using the Browse buttons. Click the Finish button when you’re done. You can now select this platform for a project by right-clicking a project and selecting Properties. The setting is under the Libraries node. My name is James Branam and I’m the NetBeans Community Docs Manager. Your blog entry would make a fantastic tutorial for our Community Docs wiki (http://wiki.netbeans.org/wiki/view/CommunityDocs). Would you be willing to contribute it? If you need any help or have any questions, please contact me at james.branam@sun.com. I look forward to hearing from you. I am trying to build a j2me application on OSX 10.3. I succeeded in X-Code, but I prefer Netbeans. My problem in adding a platform in Netbeans 5.0 is to find “the home folder”, I have put my midlet jar files in /usr/local/midp directory. 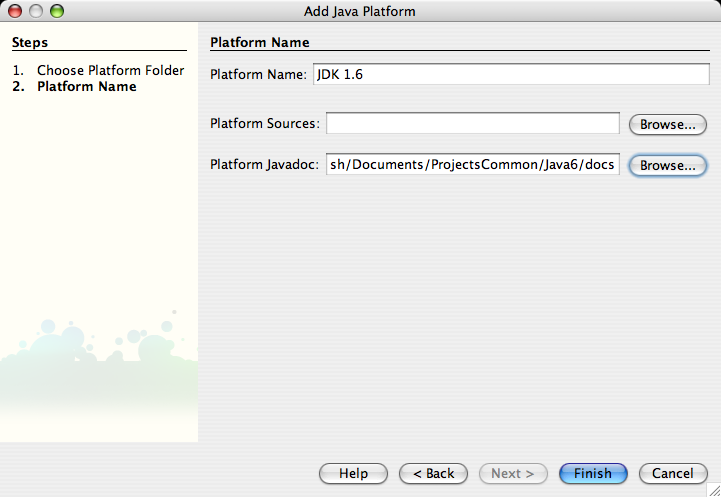 But Netbeans 5.0 doesn’t recognise it as a home folder. Maybe some explanation about “home folder” would help. I have not had any success building J2ME applications on Mac OS X. I’ve been told by some at Sun that there are binaries and legal reasons why the development kit is only available for Windows. I have, however, been using Android recently on Mac OS X under Eclipse. I would love to see some Android support under NetBeans as well. I usually do not even know how I finished up right here, however I was thinking this post was good.